Last night Squirt was a puddle of tears. Granted, she was minus a nap for the day, and that had a lot to do with her meltdown. 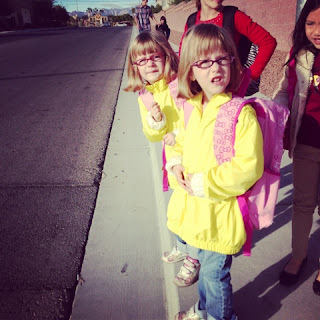 But what was most disturbing about her shuddering and crying is that it was over going to school the next day. She didn't want to go! She begged me not to go! The girls absolutely love school, in fact just the news that school is on for the next morning sends them into squeals! I became really concerned and pulled her into my lap to try and get to the bottom of the issue. After a bit of prodding, we came to the heart of the problem: the behavior chart in her classroom. Her teacher has a scale from red to purple, (or something like that) on the very top is an honor known as "role model." This means going beyond just good behavior, like helping a classmate, for example. Squirt has received role model stars twice so far this year, and I thought that was great! It doesn't seem like her teacher doles these things out willy nilly. It is supposed to be a special thing. Squirt does not really grasp this concept. She feels that if she does not come home with a role model star every day she has FAILED. She continued to sob and lament about her inability to earn role model stars every day. (Some other girl in the class has apparently received three role model stars) I then asked her if her name has ever been put below the "good behavior" color. She answered that it had not, but she wasn't very proud of that accomplishment. I know that she is very well behaved in class, and have confirmed this with her teacher. She does have some anxiety-related issues and break downs, but she's more shy and quiet than anything. It broke my heart that she truly did not believe she was a "good girl" in class. If it isn't "role model" status, it isn't good enough. Poor thing is such a perfectionist. Luckily, I was able to talk her into going to bed first and seeing how she felt in the morning. By time I tucked her in, Squirt whispered "I'm excited to wear my owl shirt to school tomorrow." Awwww, bless her little heart! I was a perfectionist too, and dealt with some anxiety over not being #1 at everything. Ughhhh....memories of elementary school angst! 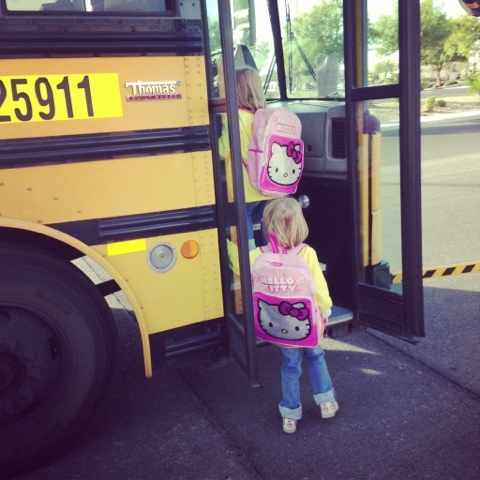 How cute they are climbing on that bus with their backpacks. Love!